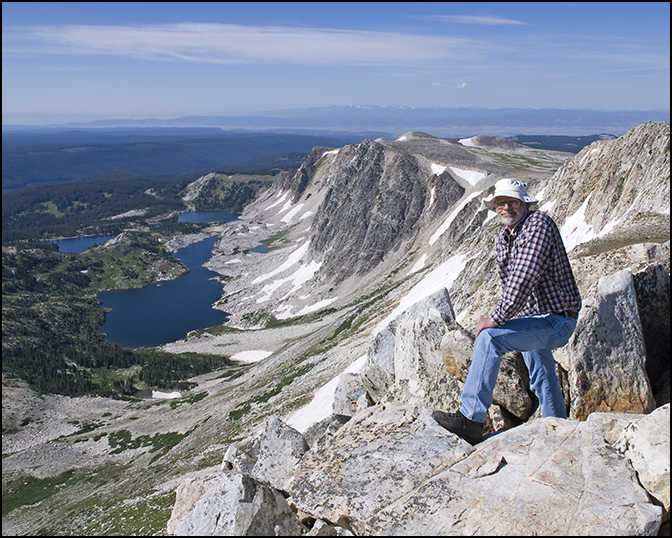 Rick Walters, Senior Photo Technician, at the top of Medicine Bow Peak. As manager of the American Heritage Center’s Photo Imaging Lab, I work with the images in the AHC’s extensive photograph collections, especially original B&W and color film. The archival goals of my work include preservation, dissemination and outreach. Currently, I’m making film duplicates from deteriorating nitrate negatives in the S. H. Knight collection. 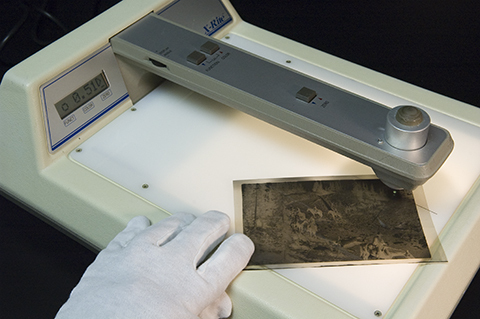 This involves determining the densities of the original negatives using a densitometer, exposing them onto modern polyester film using a vacuum contact printer and finally batch developing the duplicates in a rotary film processor. The film duplicates will last 500 years and can be scanned as necessary for research use. Here, Rick uses a densitometer, used for detecting the densities of the original photo negatives. The nitrate negative ready to be preserved for the next 500 years. Also currently, I’m digitizing the glass plate negatives in the Richard Throssel collection. This involves cleaning the glass side as necessary and then scanning with a Kodak IQSmart3 flatbed scanner optimized for transparencies. I record metadata concerning the original image into a spreadsheet. 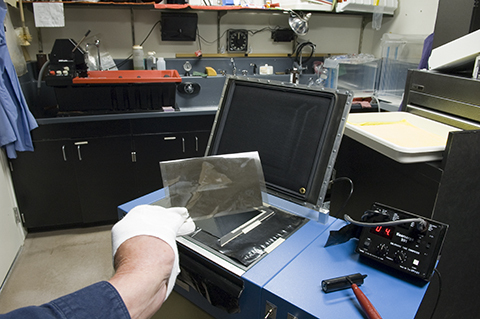 The AHC Photo Imaging Lab includes a copy stand for digitizing oversize, fragile and/or three-dimensional collection materials. The set-up includes Northlight HID lights which provide very bright illumination but low heat and UV. I use a Linhof 4” x 5” view camera with a Betterlight scanback to capture digital files up to 8000 x 10000 pixels of maps, architectural drawings, posters and AHC art. As needed I create photographic prints for AHC patrons and exhibits. Anyone can request reasonably priced AHC prints. The largest I’ve made was a 96” wide print from a S. N. Leek panoramic negative for a museum in Jackson Hole, Wyoming. Many AHC exhibits can be seen online. Permanent and rotating mini exhibits abound in the AHC building. The U.W. Art Museum hosts the most recent exhibit: Please Give Us One More Boom: Oil and Gas in Wyoming. PR and documentary photography round out my duties. Recent AHC events included Constitution Day with Wyoming Supreme Court Justice William Hill, and one of our upcoming events is the ‘Malcolm Wallop Fund for Conversations on Democracy’ program Social Media and the 2012 Election. Preserving historic photographic images and making prints are the most rewarding facets of my job. Great and important work you are doing, Rick. You have always been a professional.